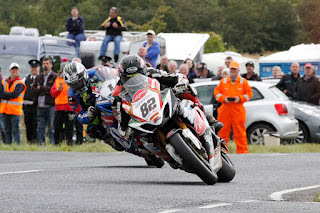 Derek Sheils and his Cookstown Burrows Engineering Racing machinery once again proved to be a force to be reckoned with on the international road racing scene by taking a hat-trick of top six finishes at the famous Ulster Grand Prix meeting on the 7.4 miles Dundrod circuit. Sheils and his team had targeted a rostrum finish but it was not to be. However, the Dubliner came agonisingly close to a top three finish when he took fourth in the Supertwins race behind Lintin, Cooper and McLean. Sheils finished just over a second away from third place. After warming up for the two Ulster Grand Prix Superbike races with a seventh place finish in last Thursday's Dundrod 150 showpiece, Sheils and his Cookstown Burrows Engineering Suzuki 1000 took a brace of top six Superbike finishes on Saturday. In the MMB Surfacing race, won by evergreen Bruce Anstey, Sheils was the first Irish rider home is sixth place and in the process he did a personal best Dundrod lap of 132.04 mph. In the concluding Around A Pound race, won by Dean Harrison, Sheils was a fine fifth, finishing just seventeen seconds behind the winner. Having qualified in seventh for the Superstock race, another top six finish was on the cards, but Sheils had to sit and watch the 'stockers' after his GSXR 1000 developed an electrical issue on the warm up lap. Team owner John Burrows was reasonably satisfied with the week's efforts: "Top six finishes in the Superbike class was what we set out to achieve so it's mission accomplished. The only riders ahead of Derek in the big bike races were the cream of international road racing. Fourth was a fine result too in the Supertwins class too although it would have been sweeter if we had managed to get a podium finish. The Superstock bike's electrical problem was our only disappointment but all in all we are very satisfied. "Derek now goes to the Manx GP, and I wish him well on the Island, before resuming his Cookstown Burrows Engineering Racing duties at Killalane where we will be determined to end the national season on a high. "Finally, I'd like to express our condolences to the family and friends of Jamie Hodson who was killed at the Dundrod 150 and our thoughts are also with the families of the riders who sustained injuries at the event. The sport can be really cruel as we know only too well." Sheils said: "I was in the thick of the battle for a rostrum position in the Supertwins race but unfortunately for me Adam McLean held third when the chequered flag went out and I had to settle for fourth. A great result, but it was frustrating to miss out on a trip to the rostrum. "The Superbike races brought me two highly sought after top six finishes and even more pleasing was a PB Dundrod lap of over 132 mph on the big Suzuki. This season has seen me up my PB lap speeds at both the Isle of Man and Ulster GP events and that shows that myself and Cookstown Burrows Engineering Racing are making great progress together. Thanks to all the team and my sponsors for their continued support."